Courtesy of David G. Myers. 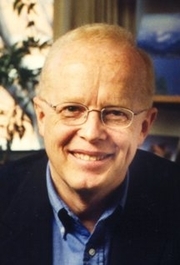 This is a short biography of David G. Myers the psychologist: David G. Myers is a social psychologist at Hope College in Holland, Michigan, and a communicator of psychological science to college students and the general public. His scientific writings, supported by National Science Foundation fellowships and grants and recognized by the Gordon Allport Prize, have appeared in three dozen academic periodicals, including Science, American Scientist, and Psychological Science. He has also written for four dozen magazines, from Scientific American to Christian Century. His books include include texts for introductory and social psychology, works that relate psychological science to faith, and general audience books on happiness, intuition, sexual orientation, and hearing loss. His agent if Susan Arellano. David G. Myers is currently considered a "single author." If one or more works are by a distinct, homonymous authors, go ahead and split the author. David G. Myers is composed of 8 names. You can examine and separate out names.